Here are my call stories in response to Rev. Tim Hart-Andersen’s sermon,“What Is Your Call Story?,” which was the subject of a prior post. The sermon drew from the Bible’s account of Isaiah receiving a direct call from God and Zacchae’us having one from Jesus. I never had such a direct call and doubt that I ever will. Instead, as will be discussed, I have responded to various requests by friends and colleagues to do something that upon reflection were calls to service. Such requests often can lead to personal reflection and conversations with pastors and friends to discern whether there has been a call and what your response should be. The title of the sermon suggests that each of us only has one call story. Yet I have had multiple calls to service and believe that is or should be a common experience. After all the sermon mentions the pastor’s father, Rev. Dr. Henry William Andersen, who had a strong calling to Presbyterian ministry, but upon his retirement from that ministry was perplexed for a while before he discovered a calling to retire and be a friend and counselor to other retired people. Before I joined Westminster in 1981 I had no religious calls to service. Shortly after I joined the church, I was asked to be an elder of the church. At the time I was surprised that the church wanted someone to serve in that capacity with such limited experience in the church, but I said “Yes” and now regard that as a call to service. This led to service on various church committees—Spiritual Growth, Evangelism and Global Partnerships, the last of which I chaired for ten years. In the process I learned a lot about these different programs and helped shape their missions. This call was expanded by an invitation I accepted to join the Board of Trustees of United Theological Seminary of the Twin Cities, an ecumenical Protestant institution, which I served, 1988-1998. While serving as a church leader, I struggled with how I could integrate my new religious faith with an active legal practice as a corporate litigator. The answer to that struggle emerged in 1985, when the senior partner at my law firm asked me to provide legal advice to a firm client and his church, the American Lutheran Church (ALC), which was headquartered in Minneapolis and since merged into the Evangelical Lutheran Church in America (ELCA). The problem was to help ALC decide what it should do in response to the U.S. Government’s disclosure in a criminal case in Arizona that the Immigration and Naturalization Service (INS and now the (Immigration and Customs Enforcement Agency (ICE)) had sent undercover agents into worship services and Bible study meetings in ALC and Presbyterian churches in Arizona that were involved in the Sanctuary Movement. The result was the ALC joined my denomination—Presbyterian Church U.S.A.—in suing the U.S. Government in federal court in Arizona over what we called “spies in the churches.” In preparation for that case, I had a trip to Phoenix to meet religious leaders involved in the Movement, including Rev. John Fife of Southside Presbyterian Church in Tucson, who in 1986 was convicted of harboring and transporting illegal aliens and served five years probation before being elected Moderator (the national leader) of my denomination. Thus, I came to understand that my senior partner’s asking me to provide legal services to the ALC was a call to religious service. Moreover, at the start of the Sanctuary Movement case, I knew very little about the Sanctuary Movement or refugee and asylum law or what had been going on in Central America. This led to my leaning about this area of the law through a refugee and asylum training program from Minnesota Advocates for Human rights (n/k/a Advocates for Human Rights) and then volunteering to be a pro bono (no fee) attorney for an asylum applicant from El Salvador. Simultaneously I engaged in research about the Sanctuary Movement and about what had been happening in that country. I then tried the case with an experienced immigration attorney in the Immigration Court in Minneapolis. As was typical at the time, we lost the case, but immediately filed an appeal to the Board of Immigration Appeals in Washington, D.C., which enabled our client to remain in the U.S. with a work permit. In 1988 I volunteered to handle another Salvadoran asylum case, which was more complicated. As a result, I decided to go to that country in April 1989 with a group from the Washington, D.C. Synod of the ALC through the auspices of the Center for Global Education of Augsburg University of Minneapolis. My purpose was to conduct investigations for this new case and learn more about the country and those objectives were accomplished. The day we arrived, the Salvadoran Attorney General was assassinated with a car bomb. This produced an intensely tense and dangerous time in the country with her security forces with their automatic rifles stationed throughout the capitol. Unexpectedly this trip turned out to be the most intense religious experience of my life and a major call to faith and service. Of the many other searing events of my week in El Salvador, another stands out. At the small Lutheran Church of El Salvador, we met an attorney, Salvador Ibarra, who was the one-person human rights office of the church. He spoke of his joy in his work even though such service put his own life at risk and thereby was calling me to continued work as a pro bono asylum lawyer. I accepted that call upon my return to the security and comforts of my office in a large law firm in downtown Minneapolis. I helped my second Salvadoran client to obtain asylum. Thereafter until my retirement from the law firm in 2001, I was such an attorney for other Salvadorans, a young man from Afghanistan, two Somali men, a Burmese man, a young woman from Colombia and a Colombian family, all of whom obtained asylum and at least some of whom are now U.S. citizens. In the Fall of 2001, after retiring from the practice of law, I audited the international human rights law course at the University of Minnesota Law School, which was taught by friends, Professors David Weissbrodt and Barbara Frey and by Professor Fionnuala Ní Aoláin, who became another friend. Thereafter David extended a surprise invitation to me to help them teach the course in the future. I accepted that invitation or call, and from 2002 through 2010 I was an Adjunct Professor at the UM where I taught the chapters on refugee and asylum law and U.S. federal court litigation over foreign human rights violations. Along the way I also learned a lot more about other aspects of this large area of law. I am grateful for this call. One of the reasons I had another retirement (this from teaching) was to research and write about law, politics, religion and history and stumbled onto blogging as a way to do just that. As a result, in April 2011 I started this blog. My writing about religion has concentrated on the life and witness of Minneapolis’ Westminster Presbyterian Church. I have been enriched by reading the Biblical texts and sermons and then thinking and writing about them. I have come to see this as my way of doing evangelism by demonstrating how an intelligent person can have a religious, spiritual life, something I did not believe possible during my 24 years of religious and spiritual nothingness before I joined Westminster in 1981. Another major subject of my blog is promoting U.S.-Cuba reconciliation, which grew out of my work on Westminster’s partnership with a Presbyterian-Reformed congregation in the City of Matanzas, Cuba, making three mission trips to the island and welcoming Cuban visitors to my church and city. Thus, I have come to see blogging as another call that I have accepted. I am eternally grateful to have received, and accepted, these calls to service. My life has been enriched! My General Thoughts on Vocation, dwkcommentaries.com (Feb. 6, 2014). Becoming a Pro Bono Asylum Lawyer, dwkcommentareis.com (May 24, 2011). My Pilgrimage to El Salvador, April 1989, dwkcommentariess.com (May 25, 2011); Inspiration of a Christian Lawyer by the Martyred Jesuit Priests of El Salvador, dwkcommentaries.com (Dec. 14, 2014); posts listed in the “Archbishop Oscar Romero “ section of List of Posts to dwkcommentaries—-Topical: RELIGION. The Canonization of Oscar Romero, dwkcommentaries.com (Oct. 15, 2018). Auditing the International Human Rights Law Course, dwkcommentaries.com (June 30, 2011); Teaching the International Human Rights Law Course, dwkcommentareis.com (July 1, 2011). The Joy of Blogging, dwkcommentaries.com; List of Posts to dwkcommentaries—Topical: RELIGION. A June 12th post reviewed the status of appropriations bills relating to Cuba in the U.S. House of Representatives. Now we look at what happened last week in Congress on these and other measures. On June 18, the Senate passed its version of the spending authorization for the Department of Defense for Fiscal Year 2016. The same day, however, Senator John McCain (Rep., AZ) said that Defense Secretary Aston Carter had pledged to come forward to Congress with a plan to close the Guantanamo prison facility. Even if the administration hands over a plan to close the facility, however, it’s unclear if it could get passed through Congress. McCain’s proposal divided Republicans on the Senate Armed Services Committee and he faces opposition from House lawmakers. The Senate’s version of the bill provides the President with a path to close the prison in Guantanamo if Congress signs off on the plan. The House version does not include an option for closing the prison, but instead would maintain restrictions on transferring prisoners. The House bill also adds additional certification requirements, bans detainees from being transferred to “combat zones” and blocks any transfers of prisoners to the United States including for medical purposes. The bill’s sections 321 would ban the transfer of certain Guantanamo detainees to the U.S.; section 322 would ban the construction or modification of U.S. facilities to house certain Guantanamo detainees; and section 323 would ban transfer of Guantanamo detainees to combat zones. Sections 331 and 333 would require certain reports to Congress regarding such detainees. Rep. Adam Schiff (Dem., CA), the top Democrat on the Intelligence Committee, criticized the bill’s banning the government from transferring such detainees to the U.S. or a recognized “combat zone.” Schiff said, “We are not safer because of Guantanamo’s existence. In fact, it makes us more vulnerable by drawing more recruits to the jihad.” Moreover, the definition of “combat zone,” Schiff added, is “so broad as to include allies and partners such as Jordan.” An amendment from Schiff to eliminate the new restrictions failed 176-246. One of the most controversial provisions of the bill was the temporary blocking of the newly implemented net neutrality rules, which was criticized by the White House without a threat of a veto. As noted in a prior post, according to the Committee’s press release, the bill contains prohibitions on (a) “travel to Cuba for educational exchanges not involving academic study pursuant to a degree program;” (b) “importation of property confiscated by the Cuban Government;” and (c) “financial transactions with the Cuban military or intelligence service.” I, however, am still unable to find these provisions in the bill. I solicit comments identifying these provisions. In the Committee Rep. Nita Lowey (Dem., NY), the top Democrat of the full committee, offered an amendment that would have removed what she called “20 veto-bait riders” or policy provisions, including these Cuba-related measures. The proposal was blocked on a party-line vote. A prior post discussed the Freedom to Travel to Cuba Act of 2015 that was introduced by Senator Jeff Flake (Rep., AZ). In addition, it now has 44 cosponsors: 36 Democrats, 6 Republicans and 2 Independents. On June 3 Senator Marco Rubio (Rep., FL) introduced the Cuban Military Transparency Act (S.1489) with seven cosponsors (Robert Menendez (Dem., NJ), Orrin Hatch (Rep., UT), Tom Cotton (Rep., AR), Ted Cruz (Rep., TX), Cory Gardner (Rep., CO), David Vitter (Rep., LA), Mark Kirk (Rep., IL). It was referred to the Committee on Foreign Relations. The bill would prohibit a U.S. person from engaging in any financial transaction with or transfer of funds to: the Ministry of the Revolutionary Armed Forces of Cuba or the Ministry of the Interior of Cuba (or any of their subdivisions); a senior member of such Ministries; any agency, instrumentality, or other entity that is more than 25% owned, or that is operated or controlled by, such a Ministry; or any individual or entity for the purpose of avoiding a prohibited financial transaction or transfer of funds that is for the benefit of that individual or entity. Excluded from these bans are the sale to Cuba of agricultural commodities, medicines, and medical devices; remittances to an immediate family member; or assistance in furtherance of democracy-building efforts for Cuba. The bill would also require (a) the U.S. Attorney General to coordinate with the International Criminal Police Organization (INTERPOL) in order to pursue the location and arrest of U.S. fugitives in Cuba, including current and former members of the Cuban military and (b) the U.S. President to provide reports on the role of the Ministry of the Revolutionary Armed Forces and the Ministry of the Interior in Cuba and the return of property that has been confiscated by the Government of Cuba. These latest congressional developments reinforce the need for continued vigilance by supporters of U.S.-Cuba reconciliation to pay attention to what is happening in Congress and to continue to express their opinions on these issues to their representatives in that body and to the larger community. I take pride in the strong support for such reconciliation in the State of Minnesota, so far away from Cuba. A recent article in MINNPOST explored this apparently strange phenomenon. Eric Schwartz, Dean of the Humphrey School of Public Affairs at the University of Minnesota and a non-native Minnesotan, believes there are three main reasons for this fact. First, two of Minnesota’s biggest industries — agriculture and medical devices — have massive potential exports to Cuba. Second, Minnesota’s lack of a large Cuban-American community and its distance from the island mean our lawmakers are not subject to the same pressures as representatives from states like Florida and New Jersey. Third, many of Minnesota’s federal legislators are reasonable people. I concur in that opinion, but believe Schwartz has missed the fundamental reason for strong Minnesota support for this reconciliation. Many people in this State are interested in what goes on in the world and are actively engaged with the rest of the world through their churches like Minneapolis’ Westminster Presbyterian Church, the Center for Victims of Torture, Advocates for Human Rights, the Minnesota Cuba Committee and various programs at the University of Minnesota and through Minnesotans’ welcoming immigrants and refugees from around the world, especially from Somalia, Viet Nam and Laos, and through major multinational corporations headquartered here like Cargill, which is leading the U.S. Agricultural Coalition for Cuba,3M, Medtronic and General Mills. Matishak, White House threatens to veto Senate’s defense spending bill, The Hill (June 18, 2015); Carney, McCain expects Pentagon plan on closing Guantanamo, The Hill (June 18, 2015);Carney, Five challenges for the defense bill (June 21, 2015). This section of the post is based upon Hattem, House passes intel bill over White House objections, The Hill (June 16, 2015). This section of the post is based upon the following: House Appropriations Comm., Press Release: Appropriations Committee Approves Fiscal Year 2016 Financial Services Bill (Jun 17, 2015); House Appropriations Comm., Financial Services Appropriations Act FY 2016 (June 9?, 2015); House Appropriations Comm., Report: Financial Services and General Government Appropriations Bill, 2016, No. 114- —( 2015);Trujillo, House panel advances rider to block Internet rules, The Hill (June 7, 2015); Trujillo, Obama administration knocks net neutrality riders in funding bill, The Hill (June 17, 2015) Shabad, Bill with $838M IRS cut advances in House, The Hill (June 17, 2015). This portion of the post is based upon the following: Library of Congress THOMAS, Cuban Military Transparency Act; Rubio, Press Release: Senators Introduce Bill To Deny Resources To Castro’s Military and Security Services (June 3, 2015); Center for Democracy in Americas, The Cuban Military Not So Transparent Act (June 19, 2015). The ultimate step in the process of becoming a naturalized U.S. citizen that was discussed in a prior post is taking the Oath of Allegiance to the United States. This is usually done in a collective ceremony. Such a ceremony was held on May 26, 2015, by the U.S. District Court for the District of Minnesota when it welcomed 453 new U.S. citizens from the following regions of the world: Africa, 167; Asia, 160; Latin America, 56; Europe 43; Middle East, 20; and Other, 7. Of the 76 foreign countries represented, the largest numbers came from Somalia, 42; Ethiopia, 34; Liberia, 26; Burma (Myanmar), 24; Thailand, 23; Nigeria, 23; and Mexico, 22. Judge Keyes then congratulated them. He said he saw the U.S. as a fabric or quilt of diverse elements that combined to create a beautiful whole that continuously is regenerated with new citizens. He urged the new citizens never to forget the poetry, the culture, the land and the ancestors of their homelands. On a personal note, Keyes said his ancestors came from Ireland 150 years ago, and he was confident that they never imagined that someday an Irishman could become President of the United States. Yet in 1960 John F. Kennedy of Irish heritage was elected to that office. So too many people in this country could not have imagined that a black man could also be so elected, and yet Barack Obama was the victor in the presidential elections of 2008 and 2012. With citizenship came many rights and responsibilities under our Bill of Rights, Keyes continued. There was freedom of speech and the responsibility to listen and understand the opinions of others. There was no established religion and the freedom to have or not have your own religious beliefs and the responsibility to understand and accept others’ religious beliefs. Another right was the freedom of assembly and the responsibility to engage in the political arena and to vote. Other words of welcome were made in a videotape presentation by President Obama. One of his messages was in American no dream is impossible. The ceremony concluded with everyone reciting the Pledge of Allegiance. One of the largest single naturalization ceremonies in Minnesota was on September 6, 2012, when 1,509 individuals from 100 countries became U.S. citizens; the largest numbers of these came from Somalia (344), Ethiopia (141), Laos (101), Liberia (95) and Mexico (84). 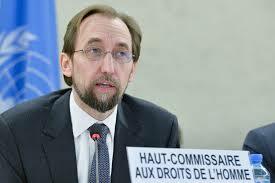 At the opening of the session on March 2 the U.N. High Commissioner for Human Rights, Zeid Ra’ad Al Hussein,  set forth his concerns on human rights. Three days later, on March 5th, he commented on his annual report on human rights. This post will examine both of these speeches. From March 2 through 5, the Council conducted what it called its High Level Segment, in which national leaders addressed the Council on the overall subject of human rights. Two of those national leaders were U.S. Secretary of State john Kerry and Cuban Foreign Minister, Bruno Rodriguez Parrilla. Their remarks will be covered in subsequent posts while another post will analyze those remarks and the speeches of the High Commissioner. The High Commissioner also expressed regret at the renewed use of the death penalty in a number of countries – Jordan, Pakistan, and Indonesia – and “the continuing extensive use” of the death penalty in China, Iraq, Iran and the U.S. Speeches about human rights in international fora often are replete with platitudes. These speeches by the High Commissioner are not. While he condemns the horrible actions of ISIL and Boko Haram, these groups are not represented at the Council. Instead the countries that are represented are often the victims of their evil deeds. Therefore, the High Commissioner spent most of his time chastising the latter countries for failing to live up to the human rights commitments they have made as they are combatting terrorism. Moreover, these speeches address some countries by name and point our their failings. In a later post we will look again at these speeches in the context of the issues of human rights in the process of U.S.-Cuba reconciliation. The Human Rights Council has 47 member states elected by the U.N. General Assembly. Currently both the U.S. and Cuba are such members. Materials about the Council’s 28th session are available on its website. Prince Zeid Ra’ad Al Hussein of Jordan was unanimously elected the High Commissioner by the U.N. General Assembly in June 2014. His many years of diplomatic service include being Jordan’s Ambassador to the U.S., his country’s Permanent Representative to the U.N. and his serving as an officer of the International Criminal Court. He holds a Bachelor of Arts degree from The Johns Hopkins University and a Doctorate in Philosophy from Cambridge University. Al Hussein, Opening Speech to the High Level Segment of the Human Rights Council, U.N. (Mar. 2, 2015); UN Human rights Council, Human Rights council opens twenty-eighth session (Mar. 2, 2015); Schlein, UN Council: Rights Being Violated to ‘Shocking Degree,’ VOA (Mar. 2, 2015). Al Hussein, Opening Statement, Item 2, High Commissioner’s Annual Report, U.N. (Mar. 5, 2015); Member States must enforce human rights amid rising tide of extremism—UN rights chief , UN News (Mar. 5, 2015); Human rights principles in struggle against extremism—Zaid, U.N. (Mar. 5, 2015).